There was a very strong turnout for the first event in the 2018-19 Night Street League in Lancaster this evening. 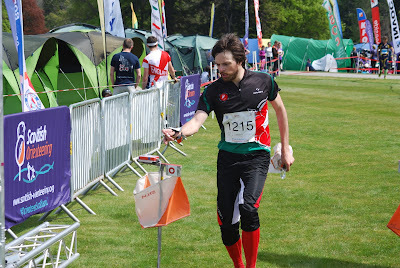 Results will follow when ready, but in the mean time why not add your routes to RouteGadget? 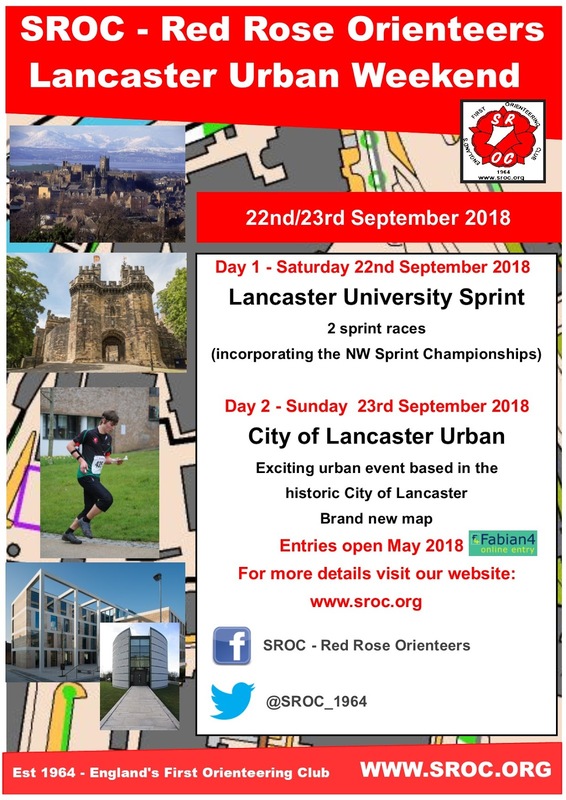 The nights are rapidly drawing in so it is time, with 3 weeks to go, to get organised for the next SROC Street League season. Pencils need sharpening, torches need checking, reflective vests need finding and bodies, both muscles and minds, need fine tuning for the challenge to come. This year in addition to the usual trophies and prizes on offer we have 2 new trophies. The John o'Gaunt trophy which will be based on a Lancaster event, with the inaugural event being on the 23rd January at Torrisholme. The second trophy will be in memory of Maurice Dean who sadly died recently and many of you will remember him as an enthusiastic member of the Street League 'scene'. It is proposed that this trophy be aimed at the 65+ section of competitors and based on the best 5 age related scores, a suitable name for this trophy yet to be agreed (suggestions welcomed, ideally not rude!). The season 'kicks off' with Rowena's event in Lancaster West on 24th October we look forward to seeing many of you there. Details of all the other venues are available here. The venue for the 2018 AGM will be the Victoria Room in Caton Victoria Institute. This is just off the mini roundabout in Caton village, near Lancaster. We have the room from 7pm am and the AGM will start at 7.30pm. Please make an effort to attend and bring some food for the jacob's join after the formalities are complete. Anyone keen to help the club develop may wish to put themselves forward for the committee; new members are always welcome! 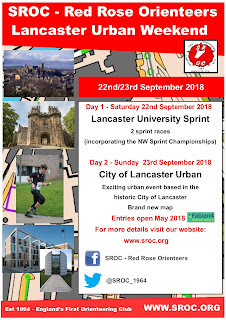 Today saw the first use of the Lancaster map, with competitors running around the city centre with a finish in the University of Cumbria grounds. Results are available here with RouteGadget here. This event and yesterday's at Lancaster University score in the NW Urban League. Results for the North West Sprint Champs held today may be viewed here. RouteGadget is available via this link. The guest speaker will be Steve Birkinshaw. Compass Sport Trophy Final - your club needs you! SROC has qualified for the 2018 CST Final which is being held at Abraham’s Valley, Cannock Chase, on Sunday 2st October. Entries have to be submitted a month before the event. Please contact Miriam Rosen by 5pm Wednesday 19th September to give her time to do this. Please provide: forename, surname, age class, BOF number and SI number. We would love to have everyone running, no matter how good you are! It's a real club occasion! As you will be running for the club your entry fees will be met in full from club funds. On Sunday 2nd September at Worden Park Leyland I am putting on an open 'Come and Try it' orienteering activity day for the MS Society Chorley and Leyland Group. I would be most grateful for any help any of our members can give me on the day. (Start times are 11am to 3pm). I need help with registration, results, start, 1st Aid, instruction and help for novices and some patrolling of the park. There will be an unusual course for you to enjoy as well as the novice courses. Scores after five events may be viewed here. Congratulations to the series winners in the various categories, most of whom received their prize at the Myerscough event. 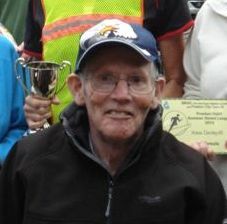 Open winners were Luigi Lerose and Anne Ockenden, vets winners were Graham Capper and Jane Anthony and the junior winners were Alex and Cate Matthew. The pairs and group prize went to the group from Stepping Stones. A couple of the categories were only decided at the final event. RouteGadget is ready for routes to be added, both courses may be accessed from the RG main page. Myerscough College was the venue for the last in the current series of sprint events this evening. All were treated to both brilliant weather and excellent use of this complex area by planner John Ockenden. The results are available here, more analysis to follow. The scores after four events make interesting reading. With one more event to go, at Myerscough on 3rd July, most of the classes are still not decided. The fourth event in the current sprint series enjoyed warm and dry conditions and plenty of quick fire decision making. Results may be viewed here. On the evening of Wednesday 27th June at Beacon Fell Country Park we are putting on the annual Scout & Guide Orienteering Championships. If this year proves as popular as previous years then we could have upwards of 100 youngsters (and some oldsters) taking part. Karen and I would therefore be very grateful for any help people can give. If you can spare the time then please contact us on nash.family@talktalk.net or 01772 721573. There is the usual range of courses for the youngsters plus two technical courses for those who wish to have a run. Bill and Dawn's comments from Tuesday's event may be read here. The main club social event of the summer takes place in the delightful Hyning Scout Wood, near Silverdale tomorrow, Saturday 9th June. Details are on the flyer. All members, new and old, are invited to come for a run and a bite to eat. Please bring your contribution to the picnic to share with everyone else. SROC are responsible for providing manpower for day 2 of the upcoming "Lakes 5 Day festival of orienteering". The event is taking place on Angletarn Pikes, an excellent area above Patterdale on 30th July 2018. The planner is Gavin Smith and organiser Tony Marlow. Tony is looking for volunteers for Starts, Finish, Parking and a few for general assembly duties. Could anyone who is willing and able to assist email him antonymarlow@gmail.com, phone 07736939856 or msg him on social media. "I’d very much appreciate your support by advertising my Joss Naylor attempt on 16th June to SROC club members, firstly in case anybody would like to support on the hills (I have supporters, but more are always welcome! ), and also to advertise my charity fundraising efforts via the Just Giving website – link below." With three events gone, two to go and your best three scores to count, the latest league tables are interesting reading! 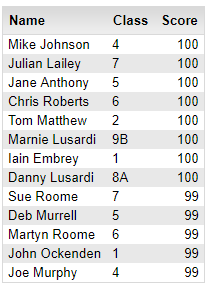 Mark Edwards maintains his overall lead but both Luigi Lerose and David Thomas have a win and a second place from their two events so that could change next time. Jo Matthew moves into first place in Open Women and Alex and Cate Matthew remain in charge of the junior classes. Meanwhile, to prove age is no barrier to success, the M55+ category is lead by a M65 ahead of a M75! (Paul Ferguson and Peter Marett). Jane Anthony has consolidated her lead in W55+. The penultimate event is on Tuesday 19th June at Cottam, Preston. Results for the 3rd sprint event in the series are on-line here. Series scores to follow. The next race in the Summer Sprint Series will take place in the flat and fast terrain of Stanley Park in Blackpool tomorrow, Tuesday 5th June. Please read the updated event flyer before travelling. A sunny Spring day was enjoyed in Astley Park today. Results are on-line here. The second event in the series will be held on Saturday 28th April in Astley Park, Chorley. Newcomers are encouraged to attend and will find plenty of help at hand if needed. 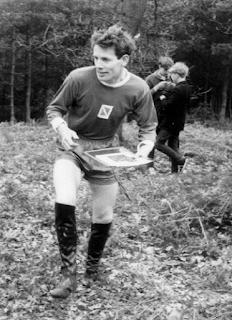 More experienced orienteers will also be catered for with a "Technical" course. Details here. The rescheduled Farleton Knott event went ahead today in lovely Spring sunshine; so different to the weather just a few weeks ago when it was snowed off. Results are available here, with additional analysis including RouteGadget, Winsplits Online and Splitsbrowser also available. A slight glitch affected about 20 runners, meaning they were not shown in the first version of the results as published. This has now been corrected everywhere. Another gremlin crept into the map during its geo-referencing which means that courses were actually longer than advertised. The correct lengths were White 1.5, Yellow 2.7, Orange 3.5, Light Green 4.0, Short Green 3.0, Green 4.4, Blue 6.7, Brown 8.8. These lengths are still comfortably within guidelines and some very fast times were recorded. We hope that no-one's enjoyment was affected. We are fortunate in that the yearly JOK Chasing Sprint is in our region, at Delamere Forest on Saturday 24th March. You could use this as a warm up for our Farleton event the following day. Details here. With apologies for the delay, RouteGadget for the street league finale event is now available. The Prize Giving for the 2017-18 Street League series took place on a pleasant evening in Garstang, hopefully a good time was had by all. Apologies for control site 21, it was not part of an advert suggesting you went to Specsavers, but was rather optimistic on my part - hope it didn't spoil anyone's run. We have also reinstated the 2 times which produced anomalies because dibbers were not cleared and checked! I am very grateful to Miriam for agreeing to do the prize giving and to Karen N for ensuring that we have already a complete set of events for the next series. Just the summer to get through before we start again. A sunny day for a change and a strong performance from the SROC team at Clowbridge means we are through as heat winners and will once again appear in the final in October. Full results are here. These were the counters, but we had many more good results. Entries have reopend via Fabian 4 and will close on 19/3/18 if not full beforehand. Entry limit of 220. The tenth and final 2017-2018 league event was enjoyed last night in Logridge. RouteGadget for the event is available here. Don't forget the mass start finale in Garstang next Wednesday, with prize giving afterwards. Details here. Following a site inspection today (Friday 2nd Mar) by the organising team, the decision has been made to postpone the event. 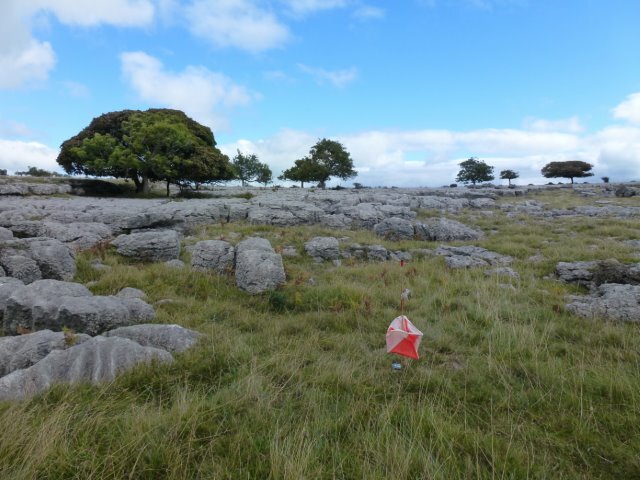 This decision has been made following an assessment of the safety of those travelling to the event, those competing and moreover those staging the event in what is an exposed location during a period of extreme weather. Further updates to follow. PLEASE DO NOT TRAVEL TO THIS EVENT.